Being proud of our home and everything in it is something that we all aspire to, whether that be a new home or a home that is in need of a refurb. A home is somewhere that we relax, work, live and grow, it is a place that we enjoy and a place that memories are made. For those homes that have little ones running around it can be hard to maintain the upkeep and decor. However having a homely and inviting decor can really create a sense of calm, especially in your children's bedroom. The decor and finishing touches of your little ones bedroom are important for making memories, and for creating a place that is peaceful and reminds them of all of the things that they love. When you think of "home" what is the one thing that you think about first? It could be smell, warmth, colour or even items that bring the home to life, such as a specific ornament or a stand out piece of furniture. These are the things that make a house a home, personal touches that reflect you and your family and your own sense of style. Adding items such as picture frames of the family or family holidays into your child bedroom is a great way for them to reflect and gather their memories. It helps them to identify and feel safe and comfortable in their bedroom surrounded by family. Other ways to add personal touches is to add items that they love, such as cushions, toys, and accessories. Heart fur cushions to add to the comfort of your childs bed, ideal for little girls who love all things pink and fluffy! 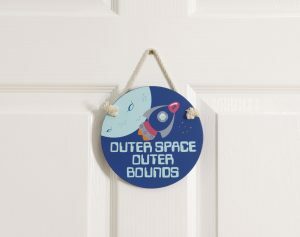 Check out our door plaques, especially this one for all of the worlds budding astronauts! 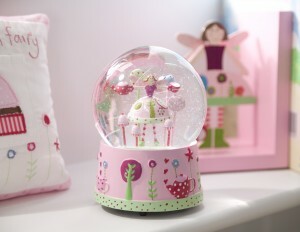 Add some sparkle with this beautiful musical fairy globe. 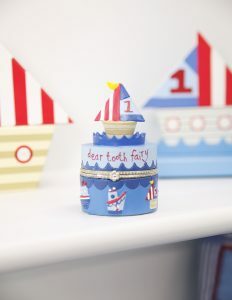 Get your little sailor ready for the tooth fairy with this cute and quirky tooth fairy box.